I have broken my self-imposed vow of silence. 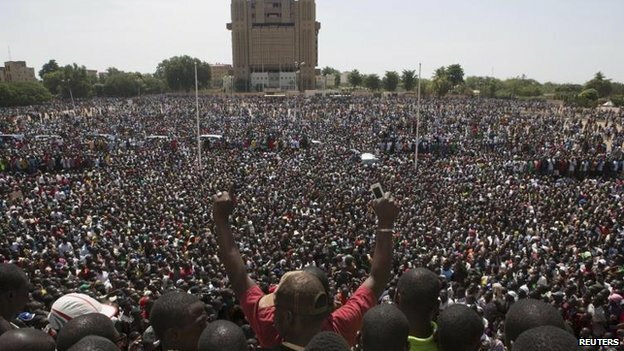 Call it sabbatical from the Puawui column, in order to make comment on this exceptionally good news for Burkina Faso, for Africa and for true democracy. My reasons are four-fold; firstly I am on principle opposed to anyone clinging on to power through manipulation of the constitution and of the people. Secondly, although I am not a Burkinabe, I have never forgiven him for his brutal betrayal of Thomas Sankara, who was his leader in the overthrow of the government of Upper Volta, which was renamed Burkina Faso. It is well known that Blaise Campaore had the encouragement and support of France – his former colonial power. 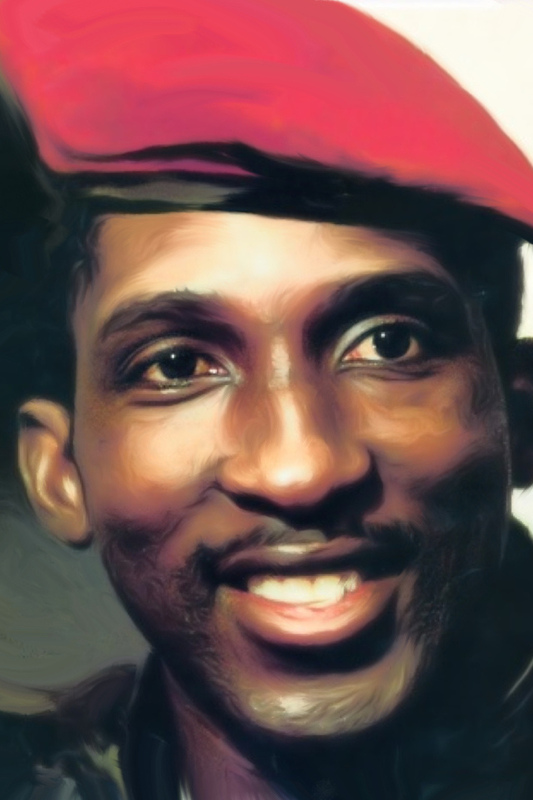 The story given out and which I am sure must have sounded hollow even in Campaore’s ears was that Thomas Sankara (Photo) was killed, as he tried to escape from custody. I was also told during a visit to Quagadougou that he Campaore then went over to the late Sankara’s mother and informed her of her son’s death, but that she was not to worry because in him she would still have a son. It was as callous as that, with absolutely no feeling for the poor woman. Then there was his involvement in our country – Sierra Leone’s civil war, when along with Liberia’s Charles Taylor, they offered assistance to Foday Sankoh and his rebels who carried the misnomer of revolutionaries. The international community was aware of this, but no action was taken against Campaore (Photo), as was with Charles Taylor because of France’s patronage of the dictator. A close associate of mine stayed in a Quaga hotel during the 1978 OAU summit in that capital. On learning that my friend was from Sierra Leone, a hotel cleaner innocently informed him with excitement that some of his countrymen had been staying in the hotel, but had been moved out to make room for the conference delegates – and named Palo Bangura as one of them. Mr. Quadrago assured me that I had nothing to fear and that my President would be safe. I have made mention of this in my forthcoming memoirs, where I also described the awkward silence between President Campaore and my own former President Tejan-Kabbah in the Presidential lounge of Ouagadougou airport. For me, the awkwardness of the situation was easy to understand. During my spell as Foreign minister I received intelligence briefing about a V C 10 aircraft carrying arms to Ouagadougou. 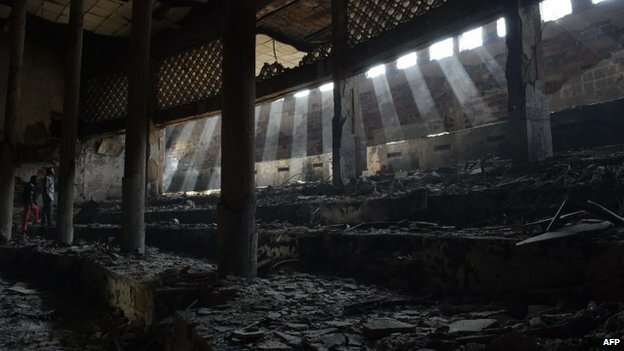 (Photo: Burkina Faso’s parliament now in ashes after yesterday’s revolution by the people). The plane taxied to a secluded part of the airport, from where the arms were loaded on smaller craft to Liberia to Charles Taylor and the RUF. I recall with some anger a meeting in Monrovia, which had been arranged by President Bill Clinton’s adviser for Africa – Reverend Jesse Jackson. The meeting was attended by both President Tejan-Kabbah and the United States Military Attaché to Liberia and Sierra Leone. 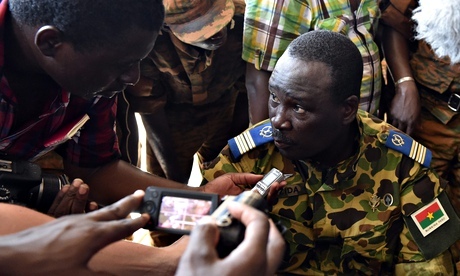 The Military Attaché informed Charles Taylor that they had evidence of helicopters lifting arms from Monrovia to the RUF in Kono. Taylor (Photo) looked straight in our face and denied the allegation. We all know where he is today. I went to Paris to persuade the government to play a more direct assistance role to my country to enhance our war effort. The French minister for development almost treated my request with contempt, alleging that his country was already heavily involved in Liberia and that they would consider our request when that programme was over. Not surprisingly, he made no mention of the French involvement in the timber industry in Liberia, which was probably why timber was excluded from the Security Council’s sanctions against Liberia. Clare Short, the then British minister for International Development brought out the same French minister with her, and together they travelled as far as Gerihun to inspect a Way Station for returning refugees from Guinea. 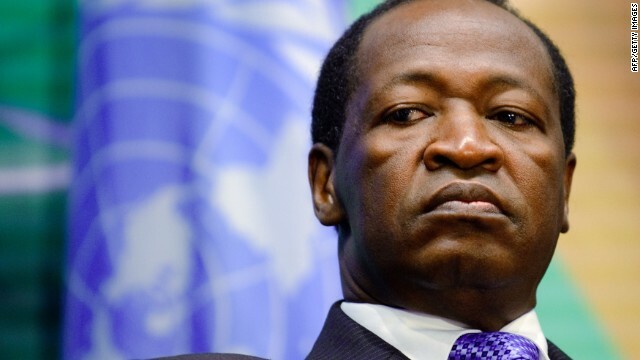 I wonder how many of Compaore’s countrymen mourn his departure, with the exception perhaps of his close allies and members of his kitchen cabinet, who had helped him to cling on to power for 27 years. I should mention the French colonial power and former French President Jacques Chirac, who often gave the former Burkinabe leader preferential treatment. (Photo: The man who has succeeded Campaore). At the end of the state banquet to mark the end of the Franco-African summit in Paris, Blaise Campaore was the only African head of state whom the French President personally escorted to the front door of the Elyse Palace. “Gone – but not forgotten” in deed, but for the wrong reasons. Wanting to retain all, he has now lost all – prestige, reputation, personal security and all. 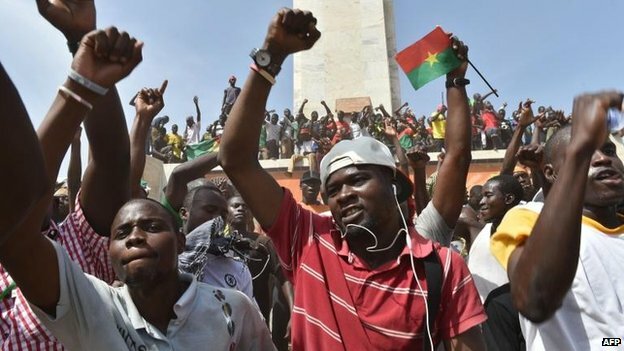 (Photo: Jubilation in Burkina Faso). 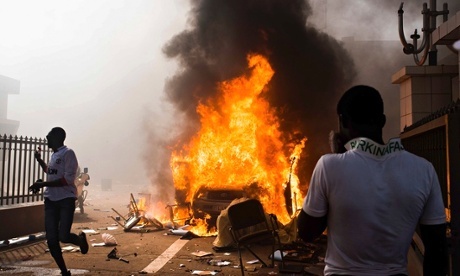 From the violent demonstrations that finally brought him down it would be no exaggeration to say that, he has gone “Unwept and unsung”, not just among his own people, but by the majority of Sierra Leoneans. In my view he could not have gone any moment soon.